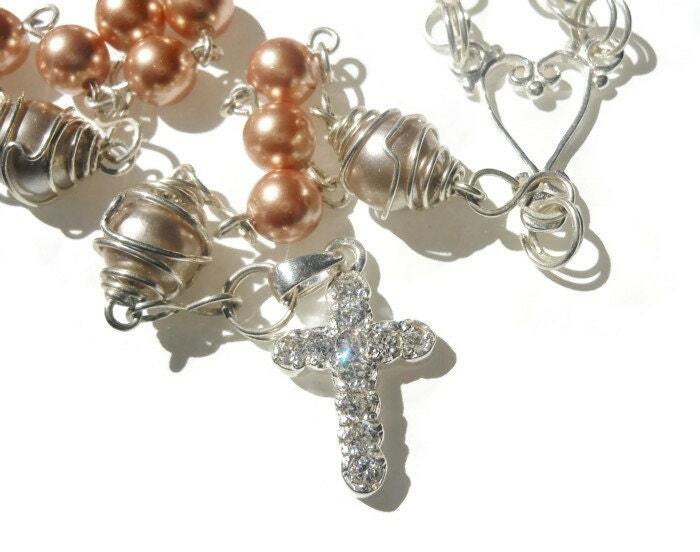 Sterling rosary beads, sterling silver Catholic rosary, 'Expression of Love' wire wrapped with Swarovski rose gold glass pearls and free pouch. 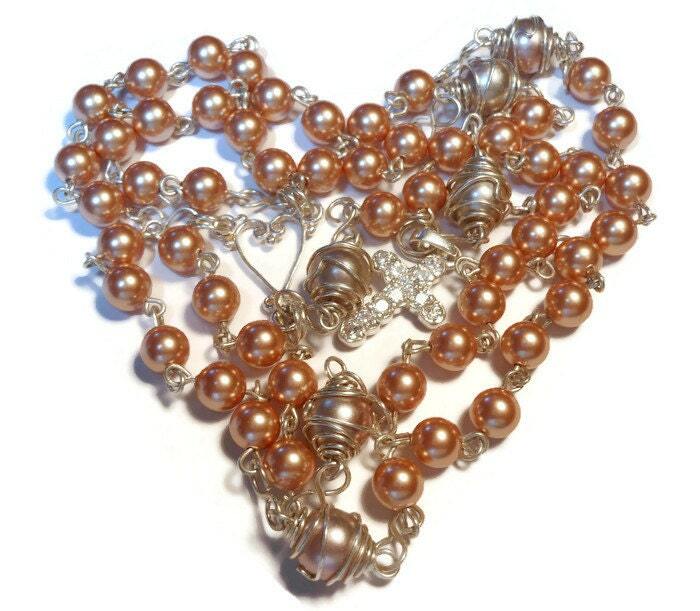 Swarovski Rose Gold glass pearls are paired here with Our Father beads of vintage glass pearls, faded by time to a two tone rose gold/champagne color. They are encased in a handmade wire cage offset with handmade rosettes and connected with handmade infinity connectors. This set is enhanced with a heart centerpiece and a cross of sterling silver and cubic zirconia. All metal is sterling and all findings are handmade. This is a perfect wedding, valentine's day or anniversary gift. The bride could carry it down the aisle with her! Generally I make the rosary as a whole concept but crosses and centerpieces can be changed when possible. Please convo me about your preferences. I also have chalice centers in Antiqued bronze brass, gold plate and silver plate finishes. Great for First Communion. Please look at the last photo to see available pouch and charms. Note that the white and blue ones have a rosary in them to give a sense of fit. 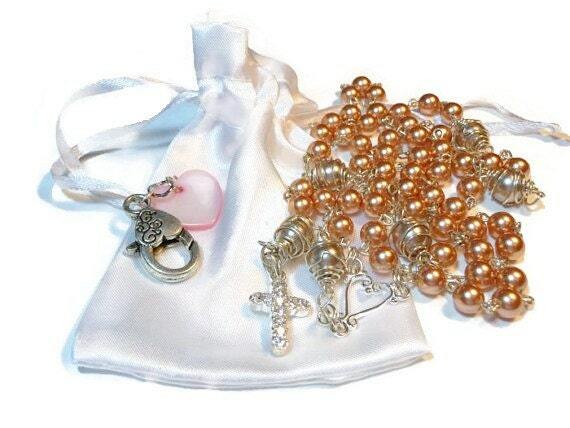 Every rosary comes with a pouch, a lobster clasp for attaching it somewhere (inside purse?) and one charm to personalize it. 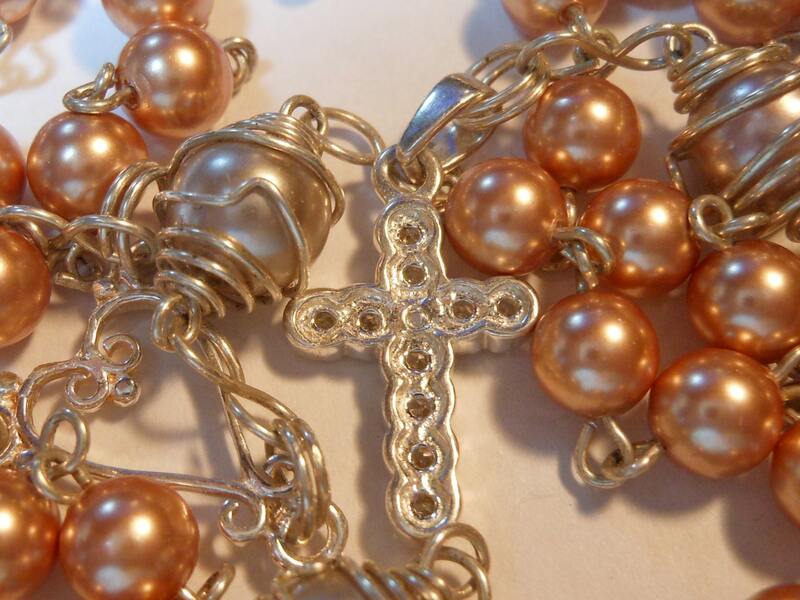 The initial charm can be incorporated into the actual rosary, if desired. Choices for bags are white satin, red velvet or black velvet in the larger ones and black or blue in the smaller. •	silver with 4 leaf clover. 1. 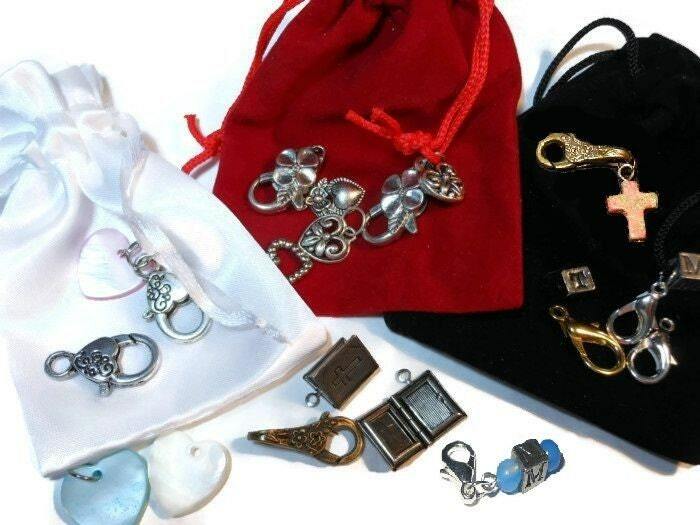 All rosaries are packed in a gift box. 2. No jump rings are used. Split rings are used for connecting all medals and crosses; this ensures a stronger hold on these most pulled areas. 4. Now with free shipping in the United States. If you are out of country and your package is small enough to lower shipping, I will refund any difference over $1.00, after insurance.